For decades, Grammy Award winner Susana Baca has represented Peruvian music to the world. 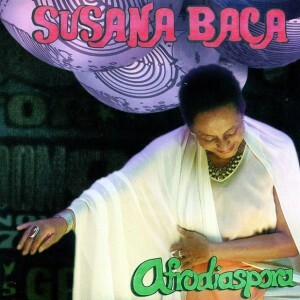 Here, Susana gives voice to her life-long immersion in the music of the African Diaspora. The songs of African descendants in Cuba, Argentina, New Orleans, and across the world…the rhythms of forro, cumbia, tango… Afrodiaspora is a travelog that spans centuries and continents through the voice of one of the world’s most celebrated singers. Greg Landau Additional Production; Javier Lazo Composer, Lyricist; Palo Mayimbe Composer; Víctor Merino Composer; Amparo Ochoa Composer; Ricardo Pereira Photography, Producer; Dara Phan Coordination, Graphic Design; David Pinto Bass, Guest Artist; Wagner Profeta Guest Artist, Triangle, Zabumba; Alejandro Ramirez Vocals (Background); Residente Pérez Guest Artist, Vocals; Margarita Rivera Composer; Russell Rodriguez Guest Artist, Jarana, Requinto; Javier Ruibál Composer; Michael Shrieve Drums, Guest Artist; Ned Sublette Liner Notes; Sergio; Valdeos Guest Artist, Guitar; Wayne Wallace Guest Artist, Trombone; Alberto Zayas Composer.